When it comes to getting the right commercial shutters manufacturer, you do not have to waste time dealing with third-party sellers. Tampa business and property owners can rely on Master Aluminum to protect their building from the constant storms and hurricanes common throughout Florida. Other types of cheap exterior and interior blinds are usually made of wood composites. However, wood is not very resistant to water and UV radiation. It also deteriorates much faster when exposed to saltwater. While you may think you are safe because you are miles inland, research shows that may not be true. A study measuring the effects of salt in the air from the coasts found that damage could reach as far as 30 miles. If your blinds are wood, then the salty air can weaken the tensile strength of the blades. This can lead to blades breaking when closing or during strong winds. 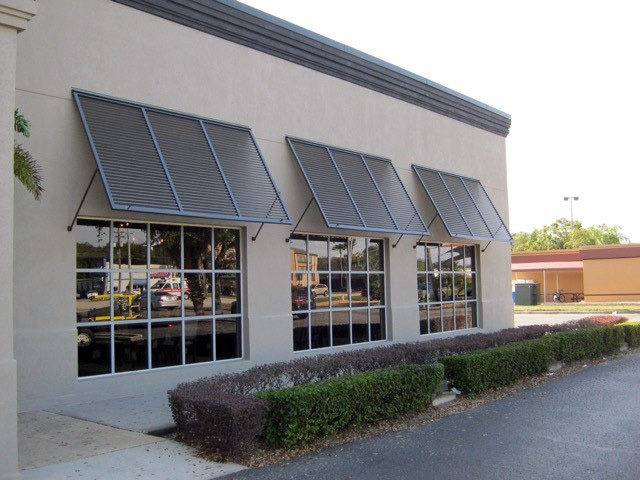 A commercial shutters manufacturer that uses aluminum blinds afford buyers year of function and fewer repairs. When searching for the best products, local providers typically offer buyers better support and quality. Many sellers are simply third-party sellers who do not control their production. Because of this, custom orders can be difficult, if not impossible to get right. Instead, they will offer an abundance of standard preset dimensions that may not fit your needs. Clients do not need to waste time browsing dimension options with a professional commercial shutters manufacturer. At Master Aluminum, all of our frames and blades are made in Safety Harbor, Florida. Tampa buyers can also rely on durable 6063-T6 aluminum to withstand constant UV radiation and water. The specific alloy is resistant to salt spray corrosion and has a particularly excellent surface finish. Rather than using heavy steel covers that only go down to cover the frame, Tampa buyers can invest in styles that are beautiful and easy to close. Clients can choose from both Bahama and Colonial styles when choosing Master Aluminum as their commercial shutters manufacturer. Clients can also decide between z-blade and foil blade options. The main difference between the two is how they function and their customizability. Colonial options can be set up in pairs and open outwards instead of dropping down. The right commercial shutters manufacturer can provide affordable wholesale pricing without leaving you with a cheaper result. Tampa buyers looking for professional quality frames should always pay attention to extrusion types. Extrusions are the way a material is shaped internally and can drastically improve the strength while lowering the weight. However, not every kind of metal is great for creating these cross-sectional patterns. Aluminum alloys are by far the most effective because of their malleability. Alloys have the benefits of being strong and three times less dense than steel. They also do not rust and are corrosion-resistant. Our proprietary extrusion contributes to creating a significantly stronger unified frame. If you live in Tampa, then you do not need to waste time attempting to use cheap home improvement store products. You can cut out the hassle by working directly with a commercial shutters manufacturer. Residents and commercial property owners alike can benefit from seamless welding and consistent, high-quality production. You can go online or call (727) 725-1744 today to get the most out of your shutters.